Most people who live on Vancouver Island have heard of the Vancouver Island marmot. In fact, this house cat- sized rodent has become our Island mascot—and maybe our new Canadian mascot too. This is understandably so, since the Vancouver Island marmots have everything going for them to grant them star appeal. They are cute beyond belief with their adorable white noses, that perpetual smile, and the way they touch noses to say hello. They are incredibly rare—in fact, they are endemic to Vancouver Island, meaning they’re found nowhere else on earth, and represent one of the five species of animal that’s endemic to Canada. And finally, they are living a dangerous adventure—since just a few years ago they almost ceased to exist. Though the story of the Vancouver Island marmot (Marmota vancouverensis) really began thousands of years ago when their colonies first appeared on the Island, our story of the Vancouver Island marmot starts in the late-1980s when biologists first sounded the alarm that the marmot numbers were beginning to dwindle. Unfortunately, the number of Vancouver Island marmots continued to decline unabated, from an estimated 300 in the mid-80s to their lowest number of less than 25 wild marmots remaining in 2001. At that point, the Vancouver Island marmot was granted the sad distinction of being one of the most critically endangered mammals in the world and the most endangered mammal in Canada. In response to their declining numbers, the Marmot Recovery Foundation was created in 1999, with the goal to save the Vancouver Island marmot from extinction and to help restore a healthy and strong marmot population to their natural habitat. “There weren’t a lot of eyes watching back in the 80s when their numbers began to decline,” says Adam Taylor, the executive director of the Marmot Recovery Foundation. Thankfully, people did take notice eventually, though by then the situation was quite serious. For example, when the recovery program started, the marmot numbers were so dire that they took the bold yet necessary step of capturing some wild marmots to create a “genetic lifeboat” in order to possibly restore their numbers in the future if all the wild marmots disappeared. 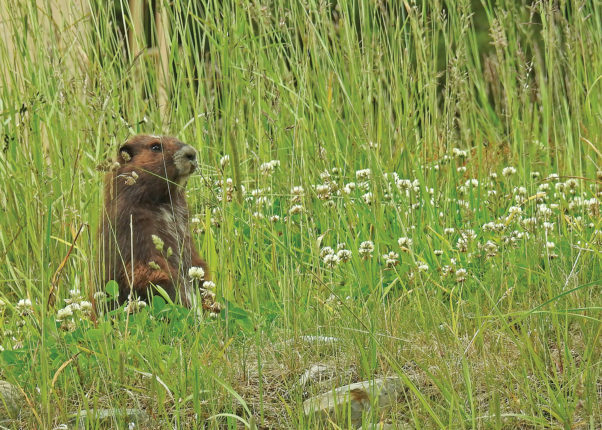 Thankfully, that never occurred, and since 2001, through the efforts of the recovery project, the Vancouver Island marmot is beginning to show strong signs of recovery. When a Vancouver Island marmot goes in search of a new neighborhood the list of requirements is short but very specific. The area must be free of trees with south and west facing sub-alpine and alpine exposure. It must be strewn with boulders, as these provide perfect lookouts as well as convenient places to sun oneself on those rare nice days. And if it is above 1,000 metres in elevation, well that’s all the better. 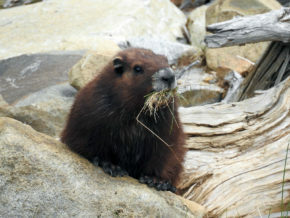 Because of these exacting specifications, suitable colonization areas are rare, and as a result, the Vancouver Island marmot is only found in three areas of the island—Nanaimo Lakes region, the Mount Washington-Forbidden Plateau region, and the western Strathcona Park-Schoen Lake Park region. When you imagine a marmot burrow you may visualize a simple dwelling dug into the earth, but you’d be wrong. In fact, one burrow was excavated and found to measure four metres long and one metre from the surface. Most burrows even contain several passages and exits. Although the marmots utilize the burrows all year, in late September they begin the process of preparing for their long hibernation. If you are lucky enough to spot a marmot in the fall, you will probably see it carrying large wads of dried grasses and mud. These materials are what they use to create a plug to keep predators out and the heat in. Eventually the holes are totally blocked, providing a safe place to survive the cold winter. Although their burrows are well engineered, the long hibernation can be a problem, as the marmots have to store enough energy throughout the year to keep them alive during the extended hibernation period. During hibernation the marmot’s heart slows to three or four beats per minute, compared to 110 to more than 200 beats per minute during activity. “When they hibernate their digestive system actually shrinks and withers,” says Taylor. “Hopefully they have enough stored energy left in the spring to re-energize their digestive system once they wake up.” In general, marmots lose about one-third of their body mass during the seven months in which they hibernate. Unlike most rodents, the Vancouver Island marmot is a slow breeding species. For one thing, a Vancouver Island marmot will not reach breeding age until three or four years. In addition, they only breed, on average, every other year. And when the stars line up and they do breed, they will only have two or three pups. “This slow breeding is a result of where they live,” explains Taylor. Although the Vancouver Island marmot endures a difficult existence, for thousands of years they were able to support healthy colony numbers that could withstand difficult years without threat of extinction. What changed in the last several decades to negatively affect this delicate balance? Climate change is causing tree growth at higher elevations, making suitable colony areas harder to find. In addition, encroaching roads have created easier access for predators, such as wolves and cougars. Finally, in the 80s, logging at higher elevations became more widespread on Vancouver Island, and marmots moved to the recently cleared areas, as they resemble the marmots preferred habitat in a lot of ways. Unfortunately, these cut block migrations hurt the marmots in two ways. It dispersed the natural colonies, lowering their numbers and making repopulation more difficult, and the cut block colonies did not survive as well since the topography was not ideal for their long-term survival. The main predators of Vancouver Island marmots are wolves, cougars and golden eagles. But the marmot population has always been small and incapable of supporting a predator population. Vancouver Island marmots are killed opportunistically as predators hunt other more plentiful prey such as deer, elk and rabbit. Because the Vancouver Island marmot is not a quick breeder, coupled with their naturally precarious existence, it hasn’t been an easy job to help their population increase. However, the Marmot Recovery Foundation has been successful through a multi-pronged approach. Firstly, they have utilized a captive breeding program based from locations across the country, such as the Calgary and the Toronto zoos, as well as a $1.2-million specialized facility on the Mount Washington ski hill. They then release these marmot pioneers into the wild hoping that they will survive, thrive and breed. Secondly, a supplemental feeding program is conducted in the spring. The hope is that with supplemental feeding the marmots may breed more often. Thirdly, habitat management is necessary when climate change causes tree growth to creep into their natural habitat. Lastly, they will relocate marmots when they see that marmots have moved to unsuitable areas, such as cut blocks. Timber companies on the Island have taken an active role in doing what they can to mitigate the damages logging practices have had on the Vancouver Island marmot population. This is a good thing, since two out of three of the colonies occur on privately owned lands held by MacMillan Bloedel Limited and TimberWest Limited. “We have a good relationship with the timber companies on Vancouver Island,” says Taylor. 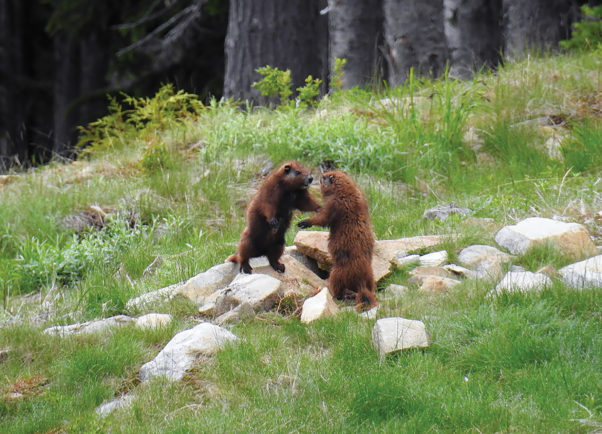 In fact, according to the Private Forest Landowners Association website, since the Marmot Recovery Foundation’s inception, Island Timberlands and TimberWest have contributed more than $3 million to the foundation’s marmot recovery efforts. But the Vancouver Island marmots are not out of the woods yet, so to speak. For example, if the recovery program were to stop today, it’s possible that the marmot numbers would not be enough to sustain them indefinitely. As a result, the Marmot Recovery Program is actively seeking donations to help them in their final stretch of saving the Vancouver Island marmot. Individuals can give a one-time donation, or they can adopt a marmot, where they pledge $10 a month. The Adopt-A-Marmot program supports the captive breeding and release program, where each donor knows they are supporting a marmot that will eventually be released into the wild.